Bitcoin climbed more than 8% yesterday (June 6), reaching a new all-time high of $2,967.48 during early trading hours. Then Mark Cuban jumped in. In fact, he agreed somewhat with Cuban's claim. Cuban "isn't entirely wrong," David said this morning (Wednesday). "The price of Bitcoin has raced ahead of itself. But what we're seeing is a lot of demand pressure on a fixed supply. That isn't changing unless people suddenly get bored with Bitcoin." "The key is that there's a general agreement among not just Bitcoin folks but venture capitalists, Wall Street bigwigs, and analysts that in the future Bitcoin will be worth a lot more than it is today – even though it's trading at all-time highs," David added. "So if there is a huge crash, a lot of people will simply see it as Bitcoin going on sale. And they'll swoop in, driving the price back up again." 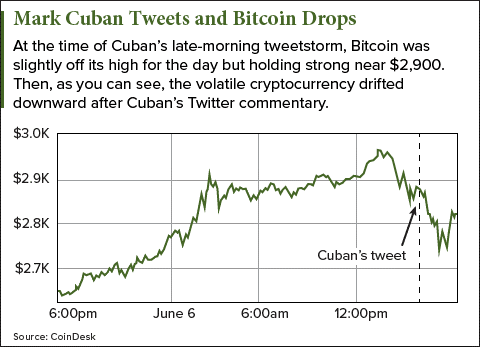 So, yesterday's Cuban-inspired price plunge actually provided investors with a discount opportunity. The Bitcoin blockchain is where all the digital currency's transactions are verified and stored. As Cuban pointed out, blockchain's storage potential could benefit myriad industries in the years ahead – healthcare, financial institutions, even the election sector. The U.S. Department of Health and Human Services, for example, sponsored a competition to see how to integrate blockchain in a way that improves privacy, scalability, and privacy for health IT last July. And now Wal-Mart Stores Inc. (NYSE: WMT) is using blockchain to track pork in China in order to digitize the hand-offs between trading partners there. These trades would otherwise be managed in paper files and subject to delays and errors. Savvy investors will want to keep an eye out for those companies using blockchain to stay ahead of the curve. Fortunately, we've done the research for you. Have a look at more blockchain profit plays right here. Follow Money Morning on Twitter @moneymorning, Facebook, and LinkedIn. Follow our Bitcoin and Ethereum expert David Zeiler on Twitter @DavidGZeiler. I made a modest investment in cryptos starting 9 April and my accounts are up almost 100k. How far can it go? Thanks for reading Money Morning. You don't specify which cryptos you bought, but right now that market is overheated. Many cryptos will fail, and a few will thrive – and go much higher. You happened to invest at just the right time, before the current explosion in the price of cryptos. Just know that this is a new and risky category. Good luck!